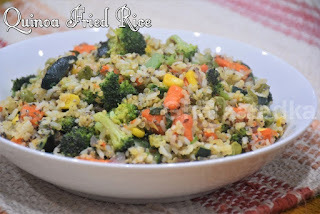 This tempting and colorful fried rice prepared with Quinoa, kali jeera rice, chia seeds and lots of vegetables. Yes, this is nutrition power house. I added almost everything I can add to make this healthier and delicious. Vegetables like zucchini, broccoli, peas, corn, and carrot make this dish colorful. So, try this recipe and make this amazing fried rice. We all want to eat Quinoa but don’t know many recipes or some people don’t know how to eat Quinoa delicious way. 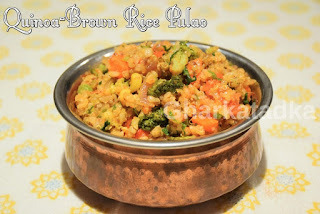 That’s why today I will share this super duper healthy Quinoa Brown rice pulao recipe. This pulao includes Brown rice, lots of vegetables and of course Quinoa. This dish has equal amount of vegetables and Quinoa and Brown rice, So you can call It Quinoa Salad also.This is Healthy, colorful, rich and tasty dish. Vegetable pulao is a versatile dish of India. 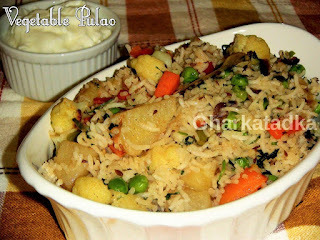 There are many different ways to make vegetable pulao, here is my recipe for making pulao. 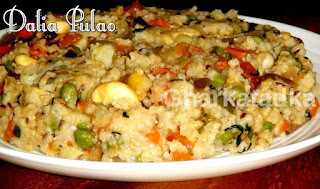 This pulao is simple, flavorful and have a good amount of vegetables. Basmati rice plays an important role in the pulao. Ghee performs the main role to the dish as it raises aroma and flavor of basmati rice. It is served with yogurt or raita. 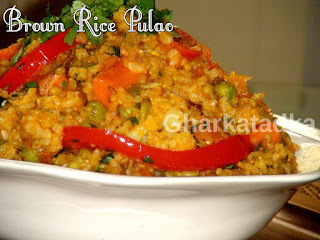 Brown rice pulao is very healthy rice dish. Various vegetables and spices make this dish rich and tasty. It can be served as the main course with or without yogurt. Dalia pulao is the simple and healthy version of pulao. Dalia or broken wheat is very healthy, nutritious, high in iron & fiber. Dalia is cooked along with broken rice and kodri. And then mixed with stir fried vegetables. 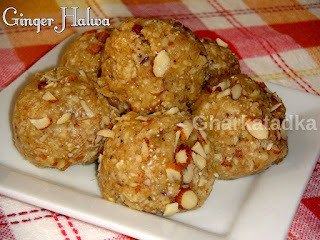 You may mix other grains like Jowar or Millet with dalia to make it more delicious. Quick pulao is one of the favorite dishes in my family. This is my mother recipe and she used to make this dish very often as we like very much. 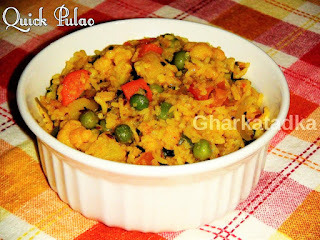 This is same as regular pulao but this is one pot dish which is an easy and quick version of my pulao dishes. This is a great meal for a lunch box or quick dinner. Masala rice is made from rice, onions and various spices. Easy to prepare and taste great with yogurt. 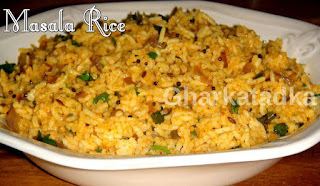 You may utilize leftover rice to prepare this dish. 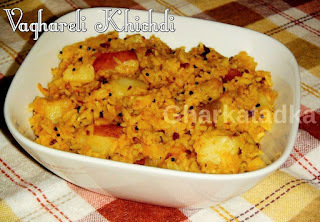 Vaghareli khichdi is my most favorite khichdi since childhood. 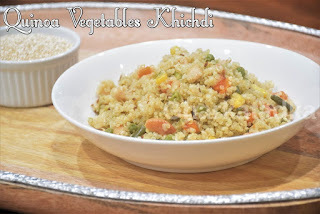 This is very simple and quick recipe of masala khichdi. This is made with rice, toor(arhar) dal, onion, garlic, and potato. 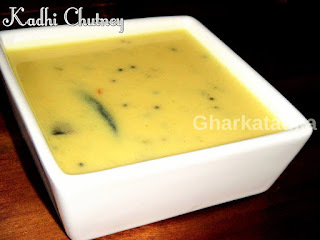 It is served with buttermilk or kadhi. 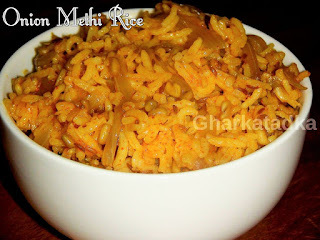 Onion methi rice is a tasty and healthy combination of onion, methi seeds, and rice. 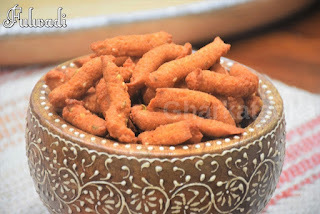 This is an easy and quick recipe goes well with curd or raita. Jeera rice or Zeera rice is a dish consisting of rice and cumin seeds. 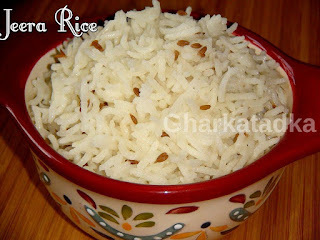 Jeera adds extra flavor and interest to plain boiled rice. 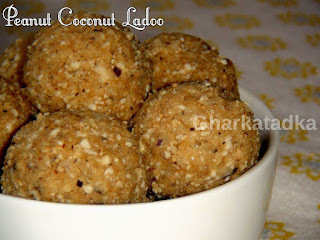 It is easy to make and goes well with most of the North Indian dishes. Methi(Fenugreek Leaves) pulao is very tasty and delicious and a great way to include greens in our diet. 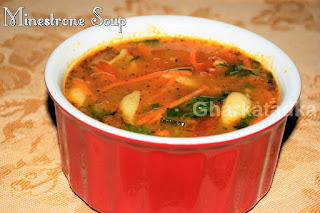 Methi is my favorite, and here is one more amazing methi recipe. Try this and you will love it. Serve methi pulao with any raita or plain yogurt. 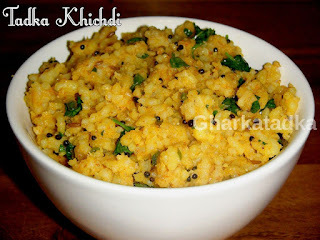 Tadka khichdi is very tasty and mouthwatering khichdi. 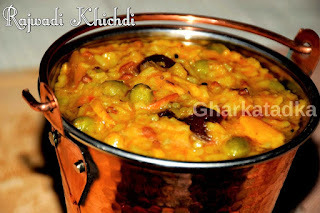 Tadka khichdi is the best example of making a delicious dish with leftover khichdi. If you don’t like the taste of plain khichdi you can make this dish and enjoy flavorful taste of tadka khichdi. 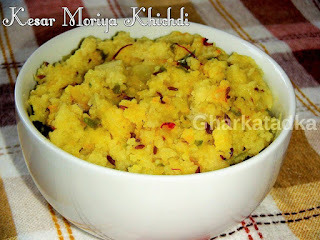 This is made with plain moong dal khichdi, chopped garlic, and spices. 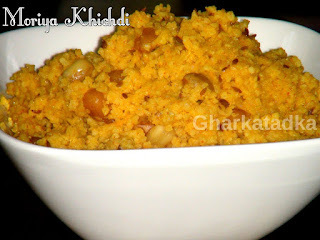 I like to eat this khichdi for breakfast with tea. Curd rice is very popular in the states of South India. 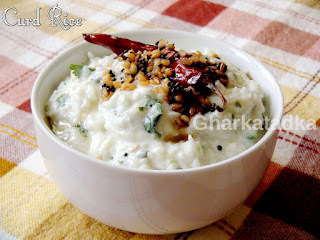 In South Indian home cuisine, it is standard to eat curd rice at the end of lunch and dinner, which helps ease the effects of the spicy main dishes. It is also said to aid digestion. 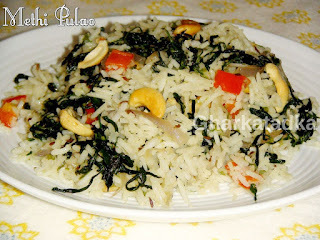 Pulao is one the most famous traditional Indian rice dish. Corn and Carrot adding additional richness to this flavored dish. 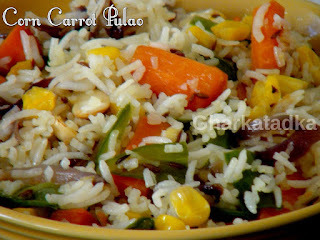 Use of white basmati rice, corns, and carrots bring nice flavor and colors to this dish. Spinach (Palak) khichdi is a 3-in-1 meal. It is the combination of dal, rice, and vegetables. 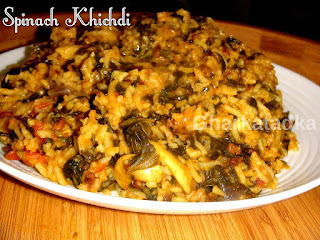 Spinach khichdi is the great way to eat spinach. It is a very nutritious, filling and a comforting meal. This is one pot meal and easy to make. So, try this dish in today's dinner. 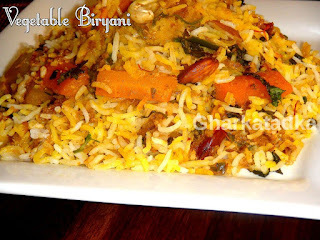 Vegetable Biryani is most famous Indian rice dish inherited from Mughlai biryani. Vegetables and Saffron give very rich and exotic flavor to this dish. It can be served with or without yogurt.